The Endangered Languages of Ethiopia – What’s at Stake for the Linguist? This is a very useful volume for anyone interested in the minority indigenous languages of Africa, and for anyone investing obsolescence. The papers are carefully ordered, clear, and full of useful data. The African situation is different from language obsolescence elsewhere, and provides unique scientific opportunities for studying the fate of minority languages. One can only hope that this volume will inspire more people to undertake the fieldwork. Thus the publication “Endangered Languages in Africa” covers a broad spectrum of the African Zeitgeist and links the peoples of this continent to people in other parts of the world where similar phenomena are taking place as part of a world-wide tendency. At the same time, the papers have to be accepted as an important input into operational research which responsible governmental agencies of the relevant countries should take seriously when considering language planning. 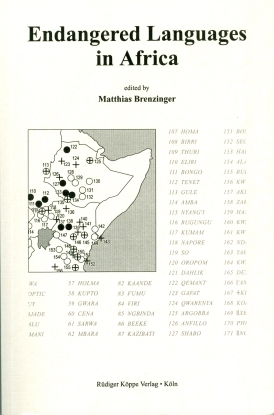 This thought provoking volume, edited by Matthias Brenzinger, is based on selected papers from the Symposium on Endangered Languages in Africa which was held during the 1997 2nd World Congress of African Linguistics in Leipzig, Germany. Despite the obvious focus on African languages, many of the papers have a broad appeal and should be read by anyone interested in theoretical issues of language loss, shift, contraction, and endangerment.